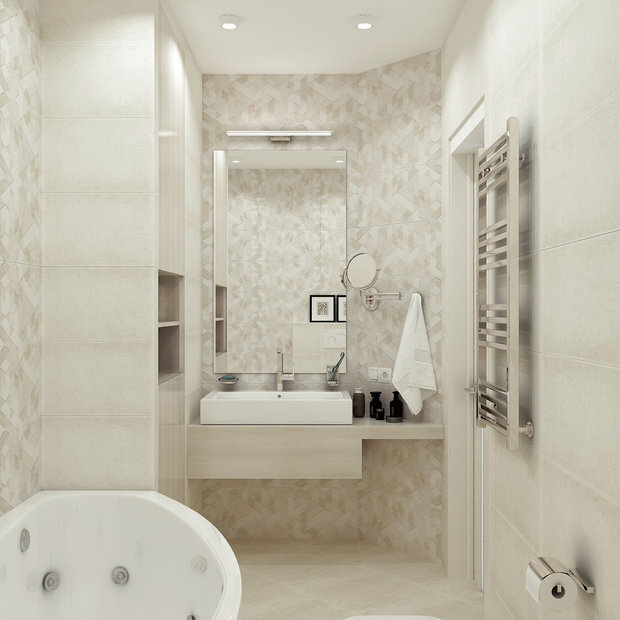 Perhaps, contemporary is the most sought after interior design style of our days. 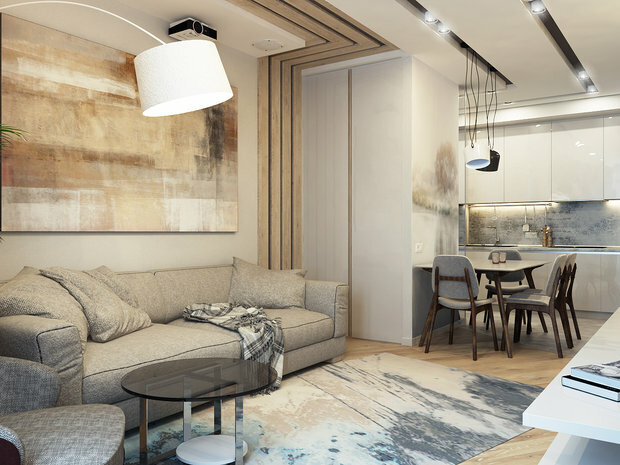 And this four-room apartment in Minsk, Belarus, designed for a young family with 2 kids is not an exception. 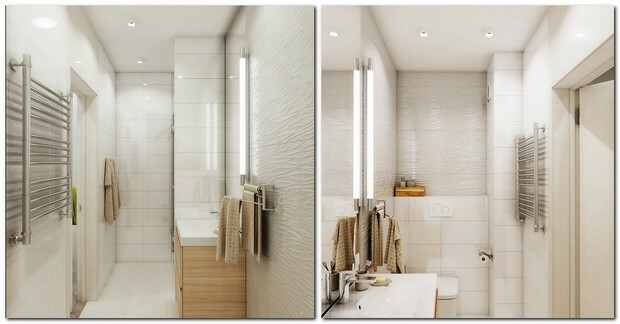 As a priority task the clients set the creation of a light contemporary interior within a limited budget. And straightaway even the first room of the flat – the entrance hall – tells us that this mission was successfully accomplished. The space is finished with very unostentatious in terms of color and texture materials. 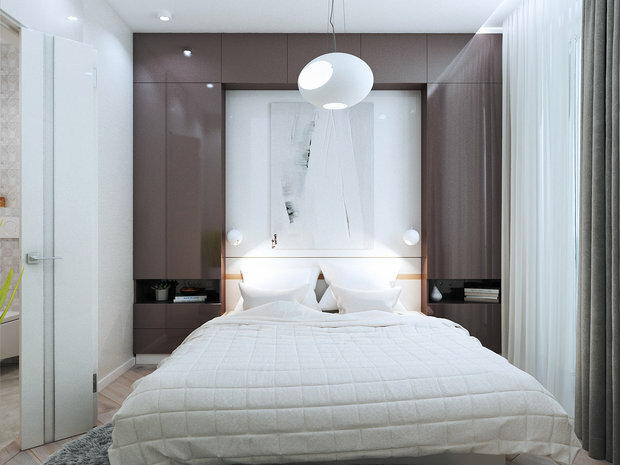 Coupled with a full-length mirror, which makes the tight room appear bigger, the suite organically fits into the room. 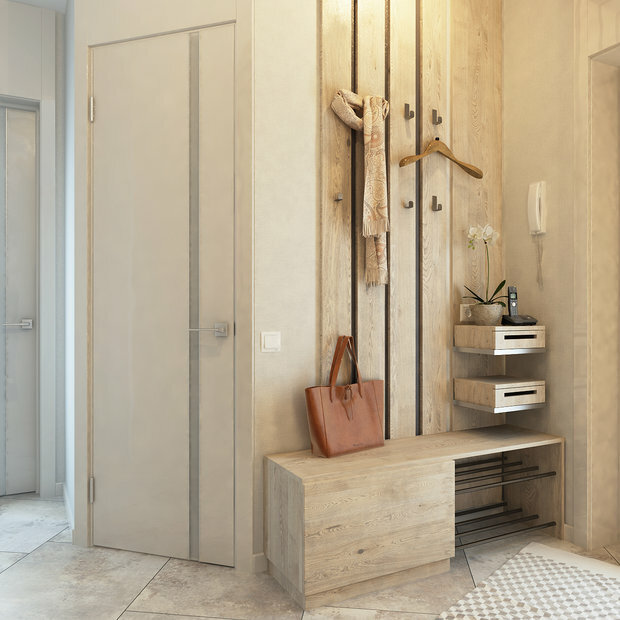 And wood textures bring the sense of warmth and hominess. 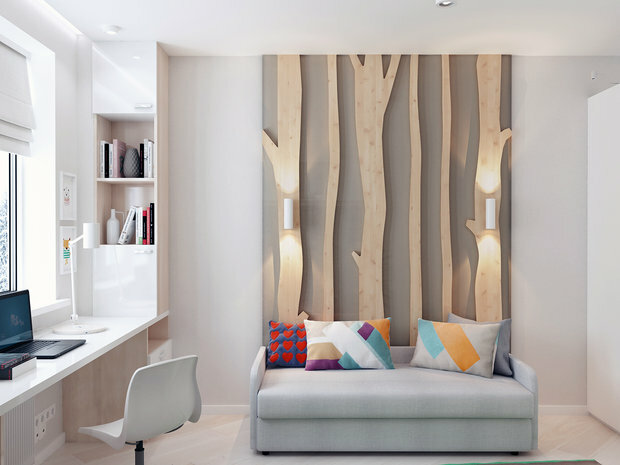 An interesting designer trick, which by the way is also replicated in the living room, is wooden panels that pass from the wall to the ceiling and then change into a set of furniture. Such a design added some dynamism and originality to the entrance zone. 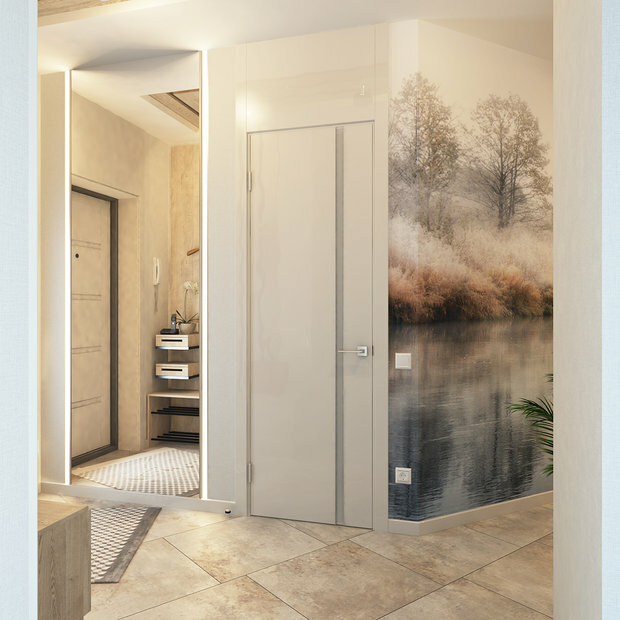 Doors in this project deserve a special mention – custom-made, they visually lift the ceiling. 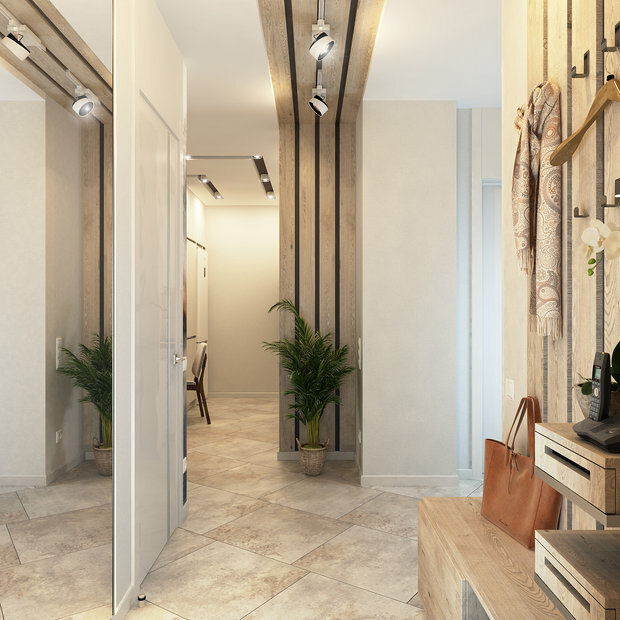 There are no walls between the entrance hall, kitchen and living room – they are open-concept. 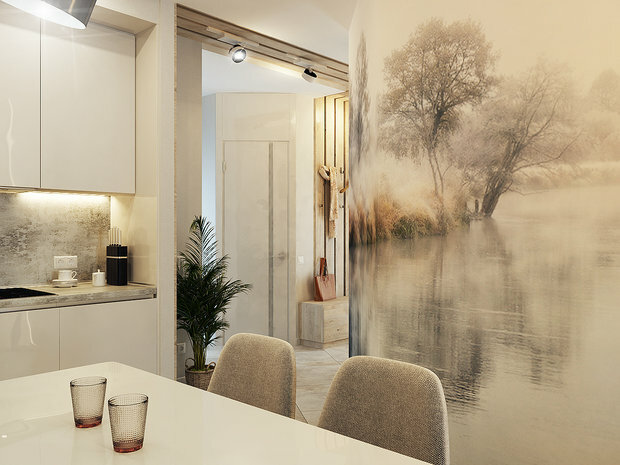 The dining area is also light and warm; largely thanks to a naturalistic wall mural that sets a special energy. 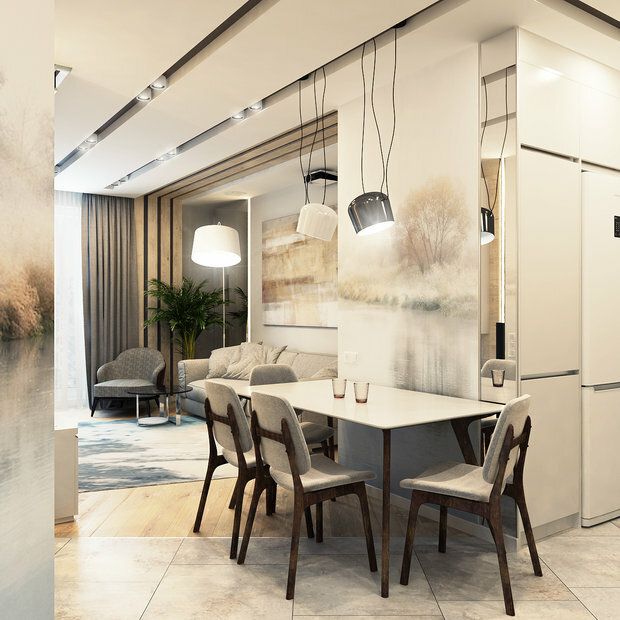 Its pastel palette perfectly blends with the color scheme of the preparation zone. 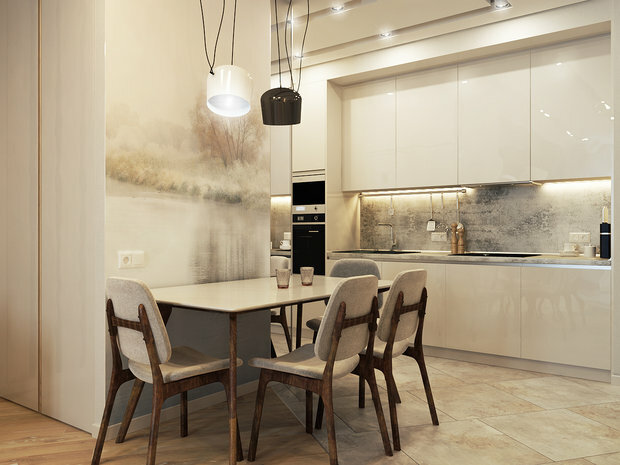 The kitchen set is composed of white glossy cabinets, and postformed laminate worktop and backsplash with concrete texture. Such seemingly brutal finishes do not run counter to the entrance hall design – they sooner bring these two spaces together. 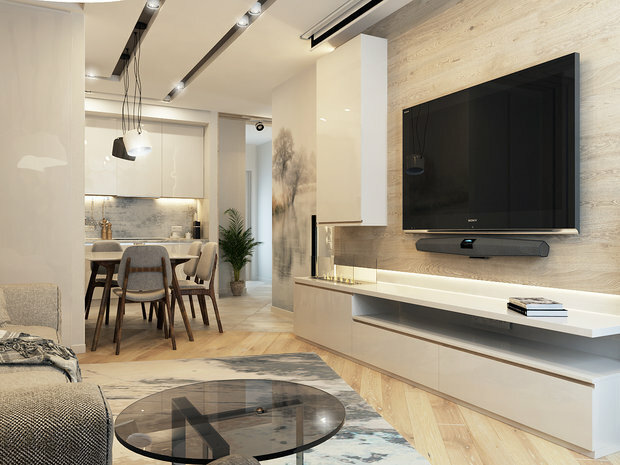 The living room is the place where the idea of lightness, warmth and contemporary mood reaches the highest point. Some unostentatious dynamism is brought by the ceiling geometry that also allowed for arranging the lights properly. 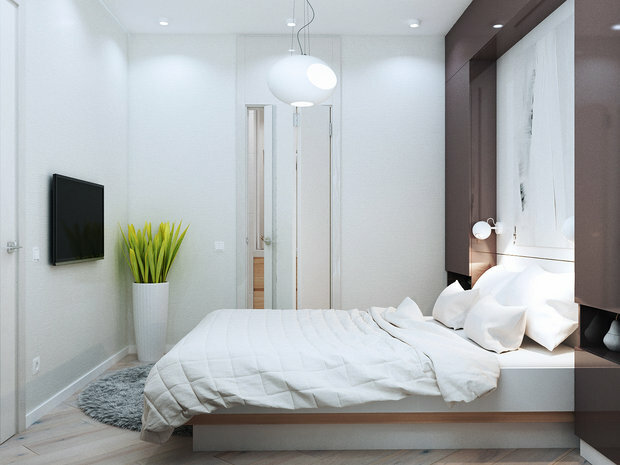 In bedroom interior design there were two main initial conditions: it’s north-facing and has a total area of just 9 square meters. So here the key points were simplicity and functionality. Customary nightstands had to be abandoned in favor of a big storage unit arranged around the bed. To soften the geometrical pressure of this bulky composition its fronts were made glossy. 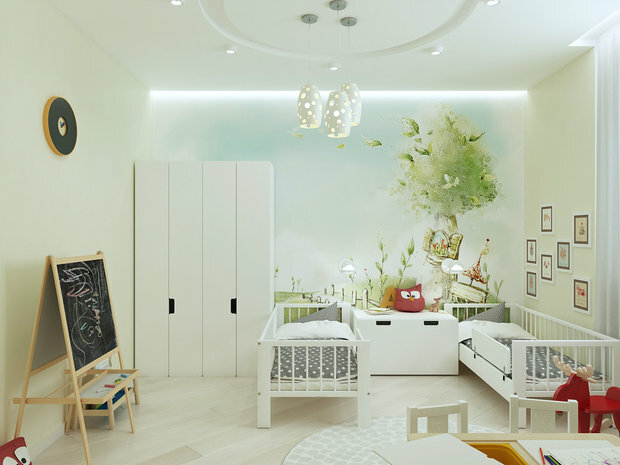 The general color concept of the kids’ room is based on the combination of white and pale pistachio hues. 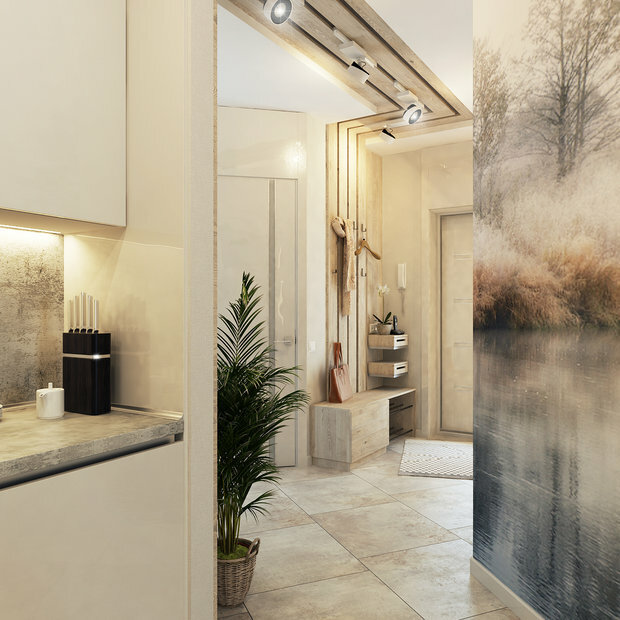 This mixture is well emphasized by a big wall mural with a fairy-tale scene. IKEA furniture ideally fit into this room in all aspects: dimensions, color and price. 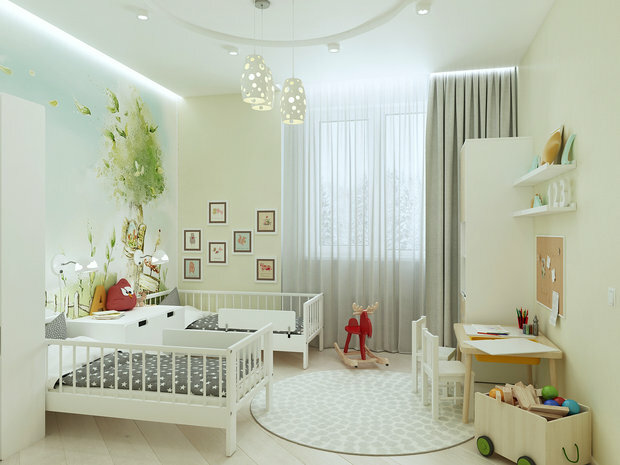 In the future, when kids grow up a little bit, the study will be transformed into one more kid’s room. And so far it’s designed for the parents. 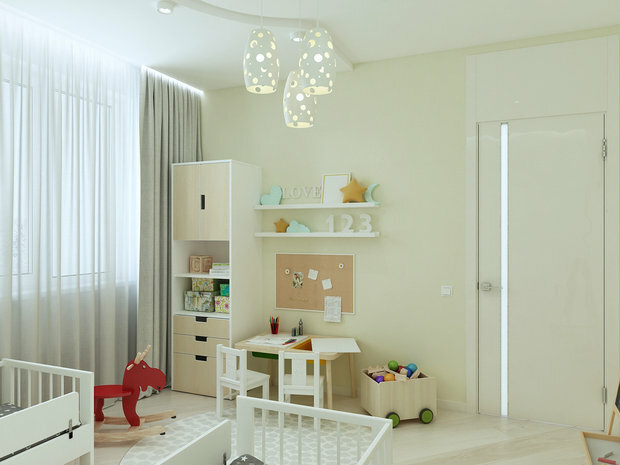 Though some room for spending time with kids is also envisaged here. Now the image of this room is kind of a compromise between a study and a future teenager’s room. 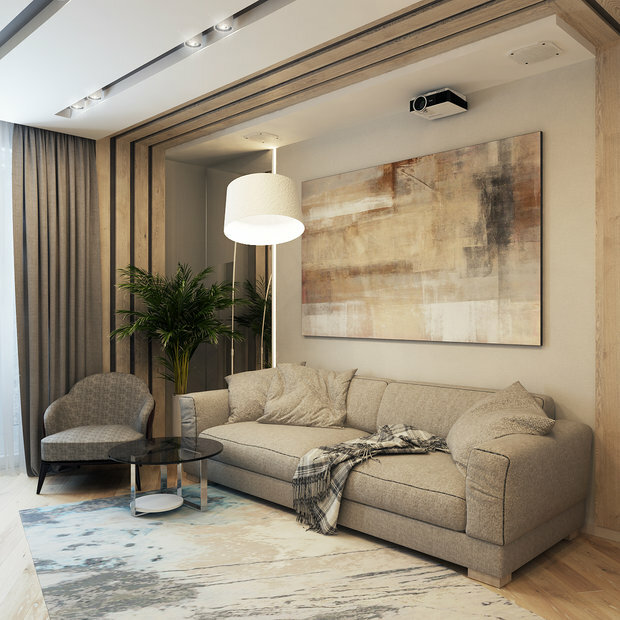 It has all must-haves for fruitful studying, working and relaxing, and its coloristic and furnishing composition leaves room for neutrality and adaptability. 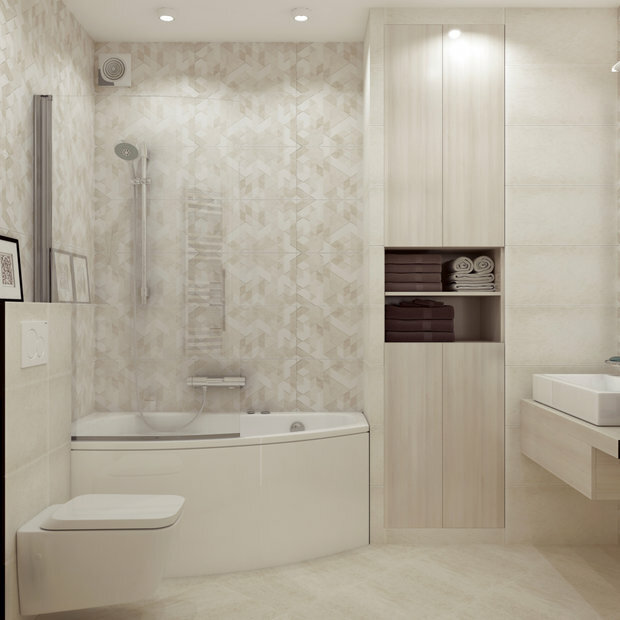 Warm color scheme of tiles, as well as their geometry and use of wood textures make the bathroom feel comfortable and warm. 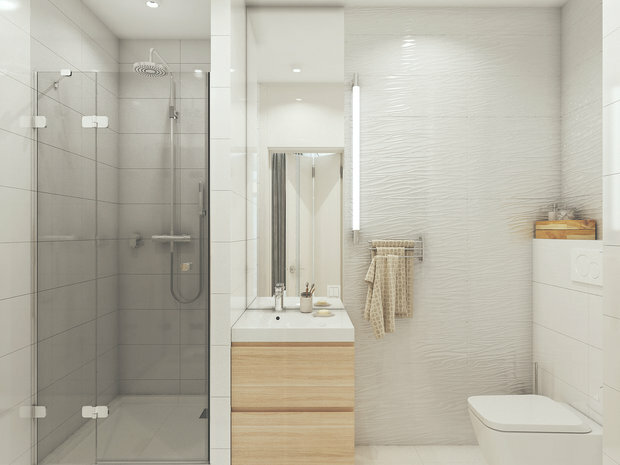 The utility bathroom is, perhaps, the only room where the clients and the designer decided to waive the general interior design concept. 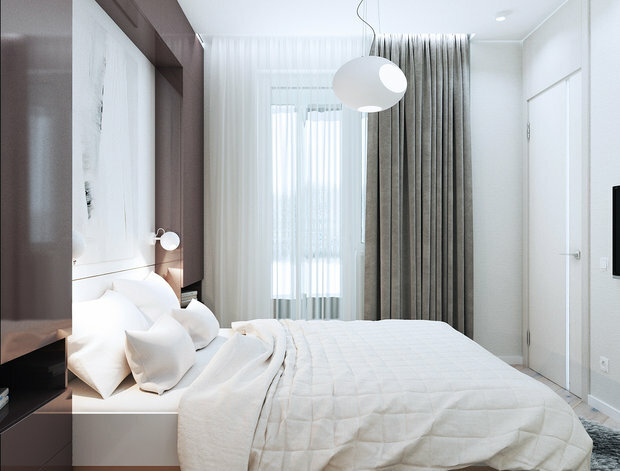 Here the interior is based on neutral, mostly grayish shades.